FindItMore | In this fast busy world everyone is focused on making their life easy and comfortable. There are different ways to achieve this, but thanks to the advancement in technology which is obviously contributing a lot in making the lifestyle comfortable and easy. 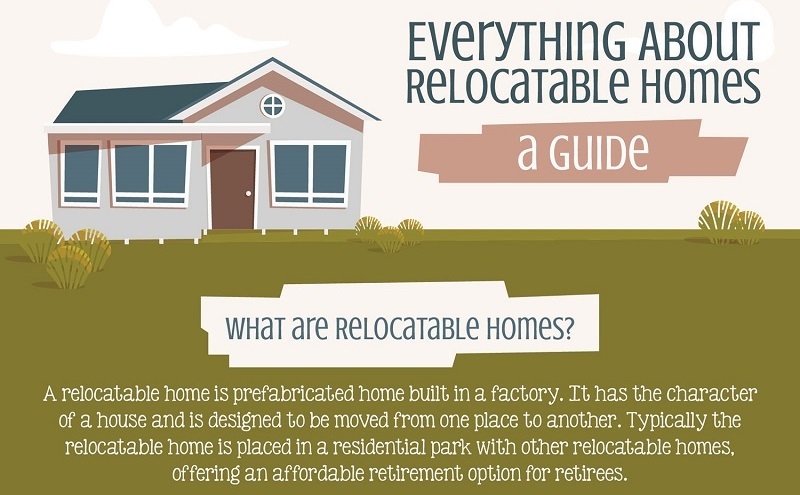 The below infographic from Holiday Life is a guide that covers all the required information related to relocatable homes. Relocatable homes are basically a prefabricated home which factories are building. As the name suggests, they are deliberately designed to be shifted from one place to another. These can be located in a park along with other relocatable homes. There is a requirement to sign a legal agreement to protect home and park owners’ interest if you want to shift it to the park. Residential parks are often marketed to people over 55 as an inexpensive housing alternative. You cannot compare retirement villages with these relocatable homes and the comparison is purely unfair. They both are different to each other. If you talk about the largest producer of relocatable homes then you will find United Kingdom on the top of that list and they are supplying the home kits to US and Australia. The most important benefit which we have noted is that these are available in any size and can be easily tailored according to your necessity. We need to focus on few things before going to obtain relocatable homes like are you permissible to make modifications in the relocatable home? Is there any rule present in regards to the friends or guests who are keen to stay with you for few days? Is pet permitted in your home? These are some basic queries that may occur in your mind while staying in these homes. Relocatable homes are having some good benefits. The major benefit is of maintenance cost which is very less as compared to the traditional homes. Transparency is the other factor to be considered here. No on going taxes, no exit fees and no duty stamps are applicable on it. It’s located among the market gardens of Virginia and its only 25 Kms from center of Adelaide. There are more than 50 relocatable homes resort situated in the idyllic town of Hervey Bay.